In digital holography, the holographic image is numerically calculated as an array of complex numbers, representing both the amplitude and phase of the optical field. This results in profiles of the optical thickness of the object with nanometric precision. When applied to cellular microscopy, minute variations in the intracellular conditions can be imaged and monitored in real time. Pictured above is a pseudocolor image of a group of red blood cells. We are Digital Holography and Microscopy Laboratory (DHML) at the Department of Physics, University of South Florida. The main theme of our research activities is in the development of novel imaging technologies with emphasis in holographic and interferographic microscopy. In digital holography (DH), the hologram is recorded by a CCD camera, instead of photographic plates, and the holographic images are calculated numerically using the electromagnetic diffraction theory. This gives direct access to the phase profile of the optical field and leads to a number of powerful imaging techniques that are difficult or impossible in real space holography. Transparent objects, such as many biological cells, thin film structures, and MEMS devices, can be imaged that reveal minute thickness variations with nanometer precision. Optical tomography by digital interference holography (DIH) yields cross-sectional images of biological tissues without actually cutting into them. Cellular motility can be studied by imaging the adhesion layers between a crawling cell and the substrate through the DH of total internal reflection, important in the study of embryogenesis, neuronal growth, and cancer cell metastasis. Furthermore, we are not only able to image cells and their components, but also manipulate them in full three dimensions, using patterns of light produced by holographic optical tweezers (HOT). Cells and organelles can be captured and tracked, coaxed into artificially patterned growth and motion, and operated on with micromanipulation and microsurgery. Students can expect to work on cutting-edge research topics and be trained extensively in advanced optical design and construction, digital image acquisition, computer programming, electronic instrumentation, and cellular and biomedical laboratory procedures. Digital holography is an emerging technology that has been experiencing exponential growth in the last decade, and has potential applications in wide-ranging areas including cellular microscopy, metrology, manufacturing processes and testing, medical imaging and diagnostics, biometry, environmental research, and food science, just to name a few. 11/06/2014 Dr. Kim has just been appointed a Division Editor for Applied Optics! 3/18/2014 Xiao successfully defends her Ph.D dissertation! 11/23/2013 Graduate students Seo and Kim from KwangWoon University in Seoul, Korea begin a week long visit to DHML to explore digital holography. 1/4/2013 Dr Jisoo Hong joined DHML. 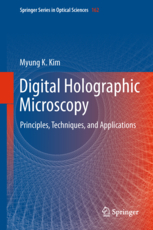 8/2011 Dr. Kim's book, Digital Holographic Microscopy: Principles, Techniques, and Applications, is published!